When Is Ramadan (first day) 2019? Ramadan (also known as Ramadhan or Ramzan) is the ninth month in the Islamic calendar. It is a period of prayer, fasting, charity-giving and self-accountability for Muslims in the United States. The first verses of the Koran (Qu'ran) were revealed to the Prophet Muhammad (also written as Mohammad or Muhammed) during the last third of Ramadan, making this an especially holy period. Is Ramadan (first day) a Public Holiday? Ramadan (first day) is not a public holiday. Businesses have normal opening hours. 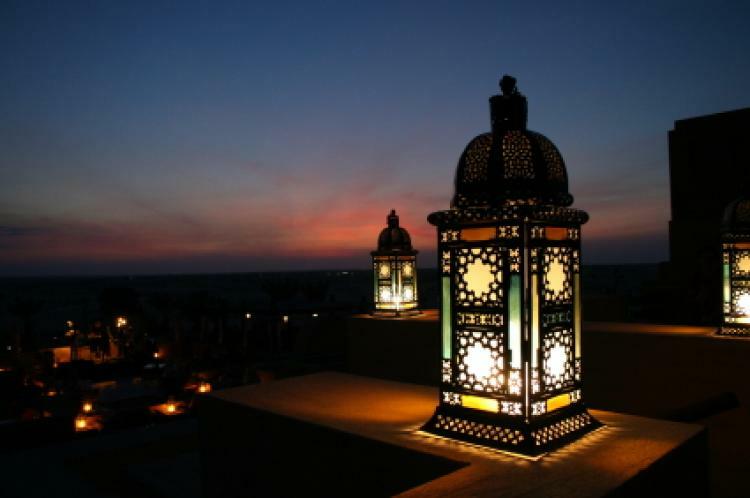 Ramadan lanterns are popular during the month of Ramadan. Ramadan is a month of fasting for many Muslims in the United States. Fasting during Ramadan is one of the Five Pillars (fundamental religious duties) of Islam. It is a time of self-examination and increased religious devotion. People of Islamic faith are encouraged to read the entire Qur'an during Ramadan. Some Muslims recite the entire Qur'an by the end of Ramadan through special prayers known as Tarawih, which are held in mosques every night of the month, during which a section of the Qur'an is recited. Ramadan is also a month for acts of charity. Some Islamic centers and organizations actively take part in charity events and activities such as giving basic necessities, including food and clothing, to the homeless or donating school equipment to schools. Some schools for students of Islamic faith may hold special events to welcome Ramadan. Some school authorities may issue requests on or prior to Ramadan, asking staff members at all schools within a district to help Muslim students perform their fasting ritual. Many Islamic businesses and organizations may amend opening hours to suit prayer times during Ramadan in the United States. There may also be some congestion around mosques during prayer times, such as in the evenings. Ramadan is the ninth month in the Islamic calendar, which consists of 12 months and lasts for about 354 days. The word “Ramadan” is derived from an Arabic word for intense heat, scorched ground and shortness of food and drink. It is considered to be the most holy and blessed month. Fighting is not allowed during this period. The month of Ramadan traditionally begins with a new moon sighting, marking the start of the ninth month in the Islamic calendar. Many Muslims (except children, the sick and the elderly) abstain from food, drink, and certain other activities during daylight hours in Ramadan. This is considered as the holiest season in the Islamic year and commemorates the time when the Qu’ran (Islamic holy book) is said to have been revealed to the Prophet Muhammad. This occurred on Laylat Al-Qadr, one of the last 10 nights of the month. Ramadan ends when the first crescent of the new moon is sighted again, marking the new lunar month’s start. Eid-al-Fitr is the Islamic holiday that marks the end of Ramadan. Read more about Ramadan Starts.